I have one bag of spinach and one box of baby mixed greens currently in my refrigerator. They certainly look pristine, all green and vitamin-rich and crisply ready for salads. The labels tell me they’re “thoroughly washed,” “triple-washed,” and “ready to eat.” But with the recent news of an E. coli outbreak traced to romaine lettuce, I’m eyeing my salad greens more suspiciously. Should I be washing them before I use them? First of all, rinsing lettuce won’t remove E. coli, according to Consumer Reports’ director of Food Safety and Research, James Rogers. He cautions that E. coli can continue to cling to produce after it’s been rinsed—and it only takes a small amount to make us sick. 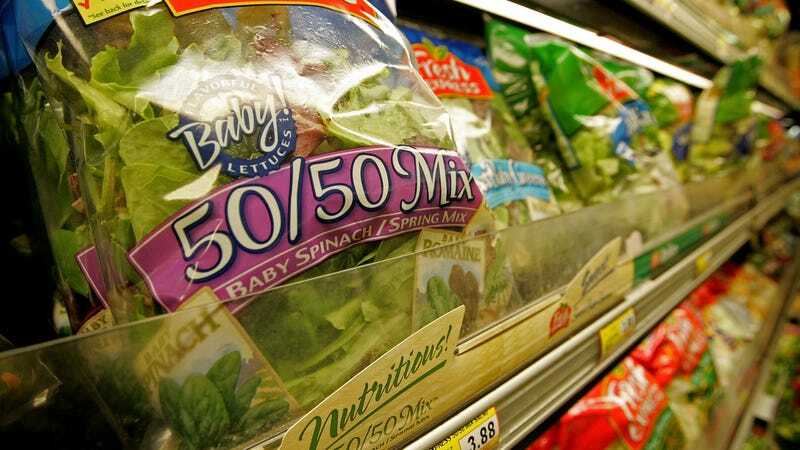 That’s why health officials urge consumers to avoid any romaine lettuce linked to the source of the outbreak near the Yuma, Arizona region, and to avoid any romaine lettuce whose origins can’t be verified. But what about other boxed and bagged lettuces that aren’t romaine? If they say “pre-washed” or “thoroughly washed,” then according to the U.S. Department of Health and Human Services, they’re safe to eat straight from the bag. In fact, washing them again in your sink may do more harm than good: “It is unlikely that consumer washing of such products will make the product cleaner compared to a commercial triple wash. It is possible that the additional handling may contaminate a product that was clean.” That can happen through cross-contamination, which happens when raw meat or eggs come into contact with the same kitchen surfaces as our produce. What the government is saying is that produce companies have standardized procedures for cleaning your salad greens, whereas most people don’t fastidiously bleach or sanitize their sinks and cutting boards. Salad companies, as expected, say their products are thoroughly cleaned, and the FDA did issue new regulations related to produce handling and packaging as part of 2016's Food Safety Modernization Act; this includes prepackaged salad greens. Generally, companies use a system of chilled water tubs and “flumes” to clean greens before they’re packaged. Both Earthbound Farms and Fresh Express tell me they use lightly chlorinated water (which still complies with certified organic regulations, in Earthbound Farms’ case). Fresh Express says its washing techniques are customized to each type of lettuce or baby greens, with adjustments to pH balance, water temperature, water flumes, and dwell times specific to each variety. Earthbound Farms says its lettuces are “not intended to be rewashed at home.” In fact, companies say, rewashing carries its own risks. “The short version is: The greens are definitely washed and ready to eat, but consumers can choose to re-rinse them if they wish. The big concern there is that it leads to cross-contamination in the kitchen,” a spokesperson for salad company Fresh Express tells The Takeout. The company says that if a customer is going to rewash the greens, they should follow food-safe, sanitary washing and drying protocol. So, if you’re not ready to bleach down your counters and sterilize your salad spinners, then it’s probably safer to just eat the salad straight from the bag. If you insist on re-rinsing, you should also insist on sanitizing your kitchen before and after.